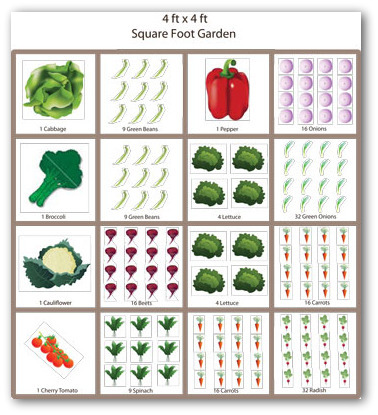 Download our free plans for a child vegetable garden or kid's garden! 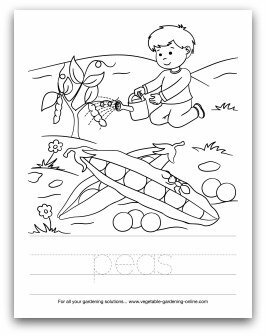 Use our free vegetable garden coloring and learning activity worksheets to help your family learn about gardening! Children's gardens can be grown beside the family vegetable garden. Or you can give a child a small plot inside the family garden to tend. Even a container with some lettuce seeds to grow can be a great learning experience for a child! 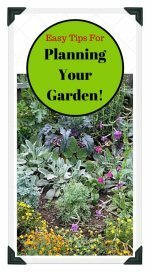 Learn to love to garden with your kids or grandkids! A child's version of a vegetable garden is a fun way to get your kids involved with their vegetables! Plan a first vegetable garden for kids alongside your family vegetable garden. One of the most important things you can do for your children is showing them where their food comes from. 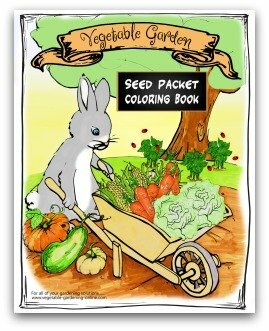 A great way to teach kids about vegetables gardening is to start a child garden. 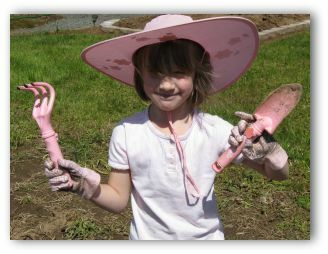 Growing corn, beans, onions, and cucumbers is fun and easy in a child vegetable garden. In fact, involving the kids in gardening is the best way to get them to actually eat their vegetables! 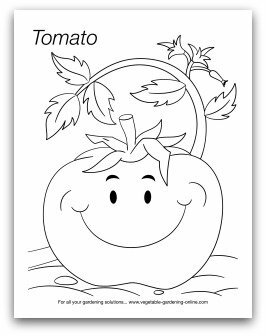 Download our free vegetable garden coloring printables for your kids, grandkids, or students to enjoy! These learning activities for kids will help teach the joys of gardening, and some simple facts about vegetables! For younger kids, our Preschool Art and Learning Activities offer coloring, crafts, and fun garden scarecrows all while teaching about growing vegetables! 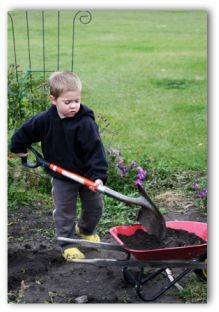 Children learn valuable skills when they help in the garden. Small plot of land, vegetable seeds or transplants, compost or fertilizer, mulch, patience, and lots of fun! Start with a 4 x 4 sunny, cleared spot or a container garden. 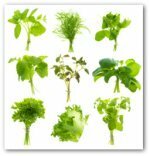 For younger children and impatient adults, we have included the following list of vegetables that give maximum yields in the shortest time frame. 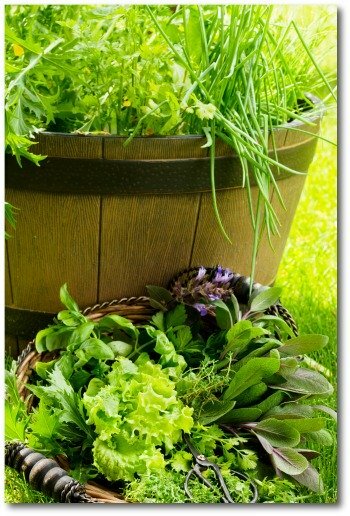 Plant vegetables in containers, rows or use square foot method. Mulch with compost, straw, or lawn clippings. 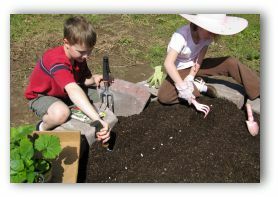 Have the children water the garden when the surface of the soil begins drying. Feed the vegetable garden every three to four weeks. Side note: although these crops are relatively pest free, make sure to use organic insecticides if controls are needed. Other natural methods include handpicking insects, or washing away insects with soap. The individual boxes can be set side-by-side or stand-alone. 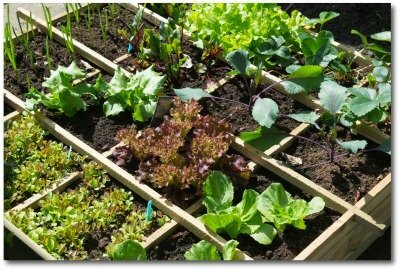 Line each box with landscape fabric or screening material to contain soil. Fill up to within an inch of the top using quality potting soil. What will grow depends on the season. Help the kids decide which vegetables to plant. Children's Gardens take the Whine out of Dinner! Wouldn't it be music to your ears to hear, "Yes! We are having broccoli again!" Kids do like to crunch and especially like to eat with their fingers. Have a picnic with fresh raw vegetables as kid size finger foods such as carrots, baby zucchini, broccoli, cauliflower, celery, and radishes. Serve with cucumber yogurt dip. 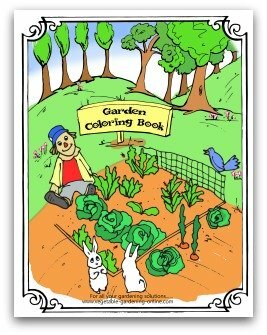 Allow the children to try their hand at growing colored miniature vegetables. The little gardeners will delight in picking handfuls of the smaller eggplant variety ‘Hansel'. Spring is generous and bold with color. Use the vivid hues of the season to encourage the little ones how rewarding vegetable gardening can be. Make a list of colors, red, brown, purple, yellow, and green, orange, blue. Send the children on a scavenger hunt in the garden to pick fruits and vegetables to match those colors. Take a photo of the colorful produce they harvest and make a picture book for each child. Title the album for example, Hannah's Picks. This video shows two of our grandchildren helping build a raised bed garden, and then plant it. 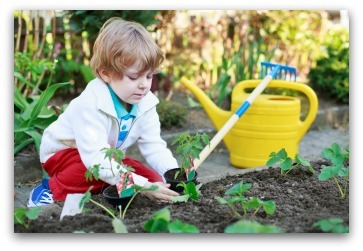 Growing a child vegetable garden with your kids or grandkids will create happy memories for everyone involved. Just remember to be patient; no yelling allowed! 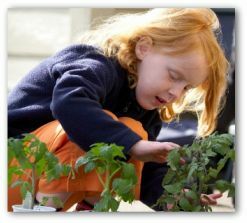 The more children are involved in a vegetable garden with planting seeds, growing and caring for plants, and helping with the harvest, the more likely they are to enjoy eating the "fruits of their labors". You may be pleasantly surprised when your finicky eaters turn into real veggie lovers!